Oban to Mull ferry fully booked for next 14 years. West coast ferry operator Caledonian MacBrayne has today announced that their popular Oban to Craignure route is fully booked for the next 5,110 days. “Getting a car to Mull right now would be like getting a Tesco delivery to the Moon” says Calmac spokesperson Tam MacJacket. “Mull is full, it used to be nice but you all ruined it by going there and eating all the cheese. We value our customers but would prefer they didn’t exist”. “You can come on the boat and buy some Macaroni but then you need to leave”. Although alternative routes exist, few have ever survived the return route through Ardnamurchan. 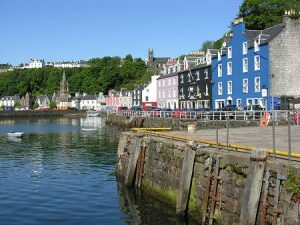 Both the Lochaline – Fishnish and Kilchoan – Tobermory runs are prone to cancellations due to the boats being carried off by Sea Eagles. Calmac vessels form the bulk of the protected birds diet. Mull is famous for it’s unnecessarily bright housing and majestic sweeping views of caravans in passing places.